For some strange reason it didn't sell very well so it's been reduced from $89.95 to $39.95 to move 'em out fast. This knife block uses safe UV-C light — the same technology used in hospitals to kill surface bacteria on instruments — to eliminate 99.99% of food bacteria and viruses from cutlery in 20 seconds. The ultraviolet bulb sanitizes knives up to 8-3/4" long from tip to bolster, killing pathogens like salmonella, listeria, and staphylococcus to help prevent cross contamination and food-borne illness. Simply rinse the knives and place them in the block; the heat from the bulb dries knives as they are sterilized. The device can be set to turn on automatically every three hours or you can set the block to sanitize knives as soon as they are inserted. 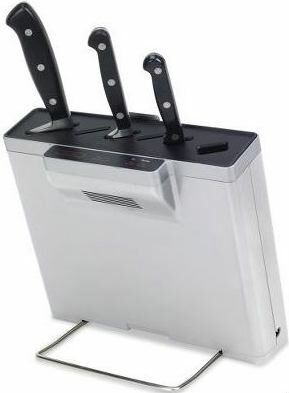 The durable ABS plastic block has five slots to accommodate chef's, serrated, boning and paring knives, and a wide opening that holds kitchen shears or a honing steel. 9-1/2" x 10-1/4" W x 6"D.
You know, at this new low price it's competitive with that portable UV toothbrush sanitizer you see advertised everywhere. I suppose you'd have a hard time slipping the knife block into your pocket, though.